Bob Menendez has been declared the winner in his hotly contested reelection bid against former Celgene CEO Bob Hugin. With 69% of the districts reporting, Menendez is leading Hugin 53.7 % to 43.%, according to the Associated Press. The AP, ABC News, NBCNews and NewJerseyGlobe all declared Menendez the winner before 9 pm. 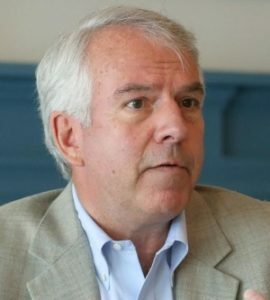 Bob Hugin, successful all of his life, would be a Great Senator from New Jersey. He has my complete and total Endorsement! Get out and Vote for Bob. Reports from all parts of Monmouth County indicate a historically high turnout for the mid-term election today. As of noon, some Middletown voting districts had a turnout of 50% of all registered voters. In Neptune, as of 10 am, 3287 voters had turned out, which I’m told is 45% of the total turnout in 2014. The turnout in a Manalapan district exceed the 2014 turnout as of noon. There were lines to vote in Freehold Township, Long Branch and Howell this morning. GOP U.S. Senate candidate visited the New Monmouth Diner in Middletown this morning. He said good turnout is good for Democracy and that he’s been hearing encouraging anecdotes from throughout the state. The borough of Monmouth Beach has a notable history of connections with United States Senators. At least two have lived there. The first, Alexander G. Cattell, represented NJ in the U.S. Senate from 1866 to 1871. The other, William W. Barbour, was a U.S. Senator for NJ from 1931 to 1943. Both men were Republicans. Cattell was one of the area’s first major developers as part of the Monmouth Beach Association. He owned a large house on Ocean Avenue. Barbour, a borough native born in July 1888, also served as Rumson’s mayor. He was the son of Colonel William Barbour, who was also an original developer of MB. A little more digging showed me that the daughter of Senator H. Alexander Smith (a Republican who served NJ from 1944 to 1959) was married at the St. Peter’s Church of Galilee in town. She married a member of the Dominick family, which would produce its own senator, Peter H. Dominick, a Republican who served Colorado from 1963 to 1975. And one more — the uncle of Senator Nicholas F. Brady (a US senator for NJ during 1982) owned a large house on Ocean Avenue in MB. So Monmouth Beach knows something about US senators. New Jersey could elect a Republican to the United State Senate on November 6 for the first time since Diff’rent Strokes debuted on NBC-TV. The Bob Hugin for U.S. Senate campaign today released its hardest hitting video ad against Senator Bob Menendez yet. Senator Bob Menendez is leading GOP nominee Bob Hugin by 11 points, 53-42% in a Quinnipiac University Poll of likely New Jersey voters released this afternoon. The 1,058 New Jersey likely voters has a margin of error of +/- 4.1 . Only 5% said they are undecided, but 13% said they could change their mind between now and the time they vote. For the second time this week, a NJ university poll said New Jersey U.S. Senate race is a dead heat. In the Battle of the Bobs, Senator Menendez leads GOP nominee Bob Hugin by 6% among likely voters in the FDU Poll released this morning. On Monday, a Stockton University Poll put Menendez up 2%, also within the margin of error. Bob Hugin, the GOP nominee for U.S. Senate and Senator Bob Menendez are statistically tied with five weeks to go before the polls close on November 6, according to a Stockton University Poll released this morning. Menendez leads Hugin 45-43% with Libertarian spoiler Murray Sabrin registering 3%. Other candidates and undecided voters total 8 percent. The poll’s margin of error is +/- 4.25 percentage points.